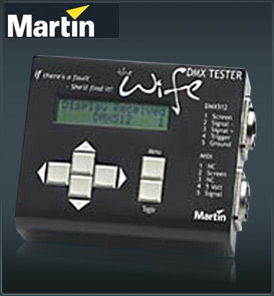 Martin The Wife is a sophisticated DMX and MIDI analyser, yet remarkably compact and simple to operate. More than just an excellent faultfinder, Martin The Wife provides all the features regularly required by stage technicians. If there’s a fault, she’ll find it. As a small hand-held DMX 512 receiver and transmitter, Martin The Wife can operate as a Moving Lamp tester, a Flicker Finder or as a Rigger's Remote. It is powered by an internal rechargeable battery with a normal life of 25 hours, and uses a high brightness backlit LCD screen. Martin The Wife could hardly be simpler to operate. Users who are familiar with either DMX 512 or MIDI find that a quick scan of the manual is enough to get started. Switch on, and Martin The Wife immediately begins to display received DMX512. Two key presses are all that is required to start flashing through the rig. Also available are 12 preset memories, which contain individual level settings for all 512 channels. Presets can be programmed with pre-defined patterns, by adjusting individual channels or by capturing received data. All data is held in flash memory, so that your preferred settings are always kept intact. The Auto-Backup feature allows Martin The Wife to be connected in-line between a lighting desk and dimmers. Martin The Wife monitors received DMX512 and, should the signal fail, switches one of the 12 Presets to the output. When the backup mode is triggered, the user can snap between presets. Martin The Wife is also equipped with a Dark Level feature that allows the channels normally at zero in the ‘Rig Check’ or ‘Transmit Dynamic’ modes to be set to a level. This is effectively a pre-heat function and can significantly improve lamp life, as the lamp filaments are kept warm during rig check. There is also a handy Power Save option that can also be disabled to allow the Wife to transmit continuously. This is particularly useful when being used as a battery powered DMX buffer. Martin The Wife DMX Tester also comes with a nice protective pouch and a set of 5 pin / 3 pin converters.